The OBW Blog - Why Go Adjustable? You might think the target market for adjustable beds are the elderly and for those with ailments, however the market has began to shift due to them becoming more user friendly and customisable. See below for a few simple reasons as to why adjustable beds may suit your lifestlye. Sleeping in a reclined position can increase blood circulation and decrease pressure on your body. Healthcare experts often use the zero gravity position which puts your head at a slightly elevated position, and your feet raised higher than your heart. This results in a considerable reduction in back pain and an improved blood circulation. Some people struggle with sleeping on a flat surface, having the flexibility to customise your sleeping surface allows you to be comfortable regardless of your situation. Can't be bothered to get out of bed, get breakfast then go and sit on your sofa? With an adjustable bed you can set it to an upright position and enjoy breakfast in bed. This day and age bedrooms aren't just for sleeping. Whether you're watching television or movies, reading a book, playing video games, catching up on work, your bed is at the centre of it. Some also come with a massage function, which speaks for itself really! 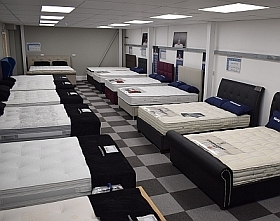 Here at The Original Bed Warehouse we have two adjustable beds and a choice of 5 mattreses for you to try. See our blog here, for more information.